When Brandon mentioned the idea of only taking carry-on size backpacks for our trip, I thought he was crazy. It was difficult for me to imagine how to pack for an indefinite amount of time into such a small amount of space! But I did it! While it took quite a while to decide which tops, toiletries and shoes to bring, I was happy I was able to make it work. If you’re looking for Brandon’s packing list, click here. 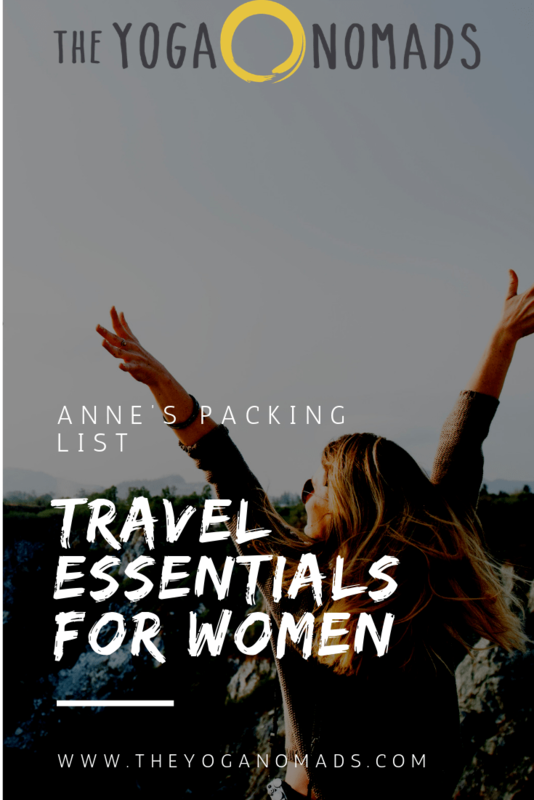 Here are my travel essentials for women! 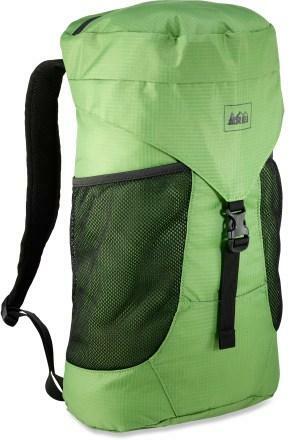 One of the best carry on sized backpacks for women. This pack fits perfectly in an overhead compartment even when it’s completely stuffed full. 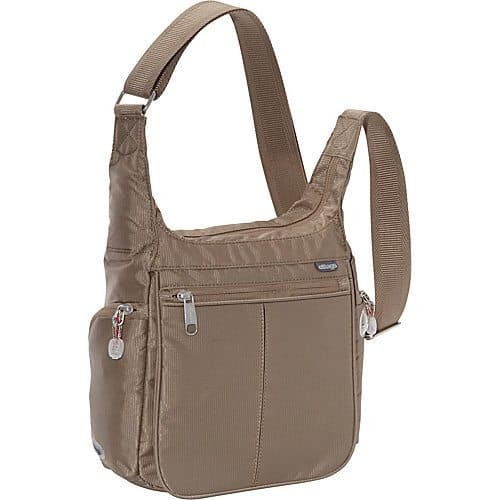 The hip pads and shoulder straps are comfortable and I enjoy the layout on the inside. The inside pockets fit my laptop safely and keep my other valuables hidden. The addition of my packing cube and stuff sacs help save on space in the main compartment. 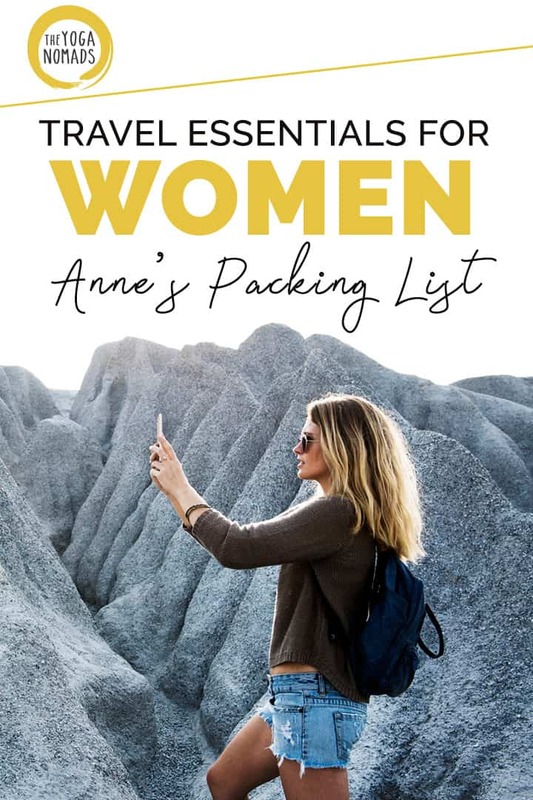 Fellow long-term traveler, Erin from Never Ending Voyage, also agrees that it’s a great backpack for women! Changes I’d make: Add pockets to the hip pads for easy and quick access to things like cash, chapstick, etc. Main motivator: Small enough size to fit inside my Osprey without taking up too much space. I scored this daypack on sale for $13. It must have been an off season color (I got a dark berry colored one, not listed on the site). Pretty comfortable and stuffs into itself for easy packing into my Osprey when I’m not using it. It easily fits my 11″ Macbook Air along with other items. It surprisingly fits more than I think, every time I fill it up. I use a carabiner to attach it to my backpack. 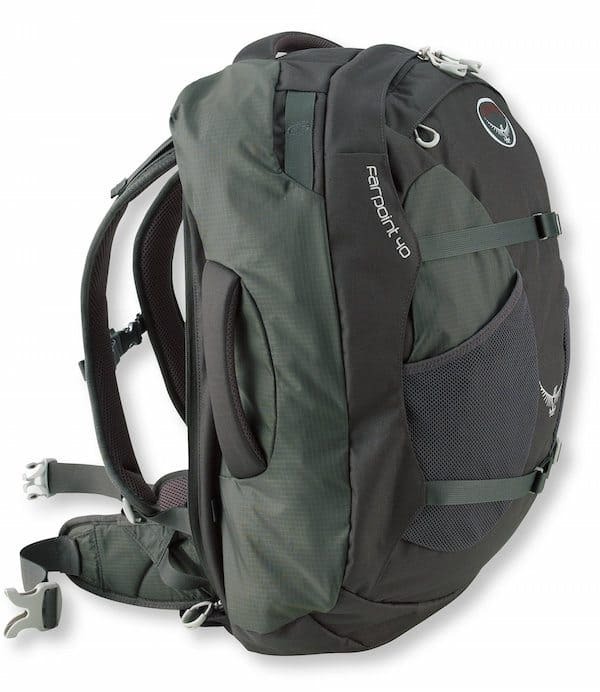 Here is a list of our top 5 daypacks for traveling. Changes I’d make: More comfortable straps. Not great for long hikes as the straps dig into your shoulders. Main motivator: Cross-body and not hideous. It was hard for me to choose a purse without seeing it in person first, but the reviews on Amazon were great so I pulled the trigger. It has TONS of pockets so I always felt as though my things were safe and secure inside. Even more spacious than it appears in the pictures; I was able to fit both my iPad and Kindle inside at the time and still zip it up. It’s no Marc Jacobs, but it is pretty cute! Changes I’d make: Smaller. The more I used the purse, the less I felt like I needed all the space it provided. And then I’d complain about feeling like a “traveler” because of it’s appearance. Ha! These shoes have been amazing. Super lightweight and flexible so they pack up easy. It’s like I’m wearing nothing on my feet. They also dry quickly which was also a motivator. Equally as comfortable with or without socks which is great in a tropical climate, to have the option. Changes I’d make: NONE! I absolutely love everything about these shoes. Don’t leave home without your traveling yoga mat! I didn’t think I would ever need travel insurance and even though it’s not very expensive I still didn’t want to buy it. I decided to get travel insurance to please my mom and to have a little extra peace of mind. Fast forward a few months and I’m in the hospital in Bali after getting hit by a motorbike! Thank god I had travel insurance – they covered all my hospital bills (total over $1,200 USD). We use and recommend World Nomads – they are the most popular, have the best coverage, and reimburse you in a timely manor. No brainer! Click here for an overview of World Nomads travel insurance. These have been amazing. 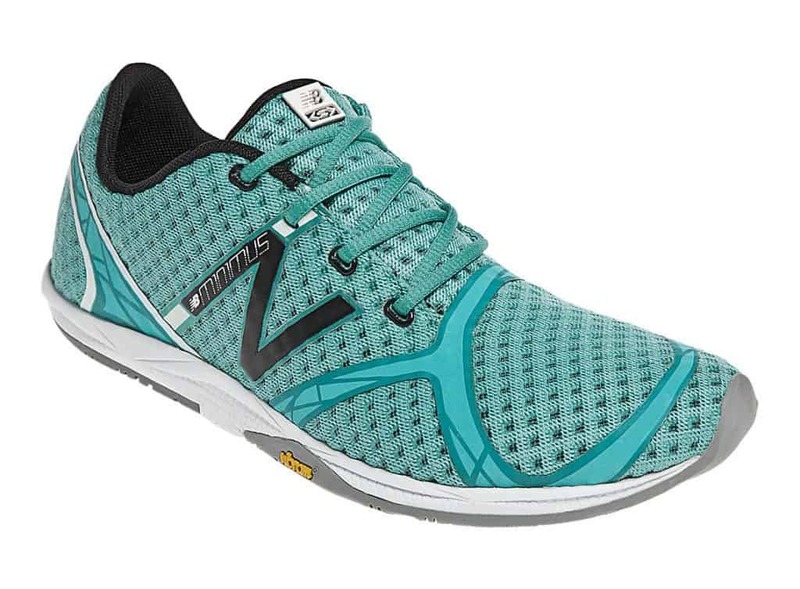 Instantly comfortable with no break in needed. Fit snug to my foot and I can wear with or without socks. I am so happy I did my research and ended up with this pair! India and most of SE Asia are fairly conservative making this lightweight scarf perfect to use as a cover-up without being too warm. It has also come in handy for use as a bed sheet, blanket and skirt. I highly recommend any woman traveler to get one! Replaced my purse about half way through and gave it to Brandon’s mom. I purchased a cute cross-body one at a market in Bangkok. Although the one I had had a bunch of pockets and was practical, I ended up wanting one that was a bit smaller. Swapped out my iPad2 for a new MacBook Air 11″ . The iPad was not easy to work on for extended periods of time. Extremely happy with the Macbook Air. Packing for long-term travel takes A LOT of thoughtful consideration. For me, I prioritized comfort, utility and versatility over style. That was hard coming from a girl who loves fashion and style in general. I found that wearing the same thing day in and day out left me with one less decision to make. When I got tired of something, there were endless markets selling clothing so we could swap pieces out. 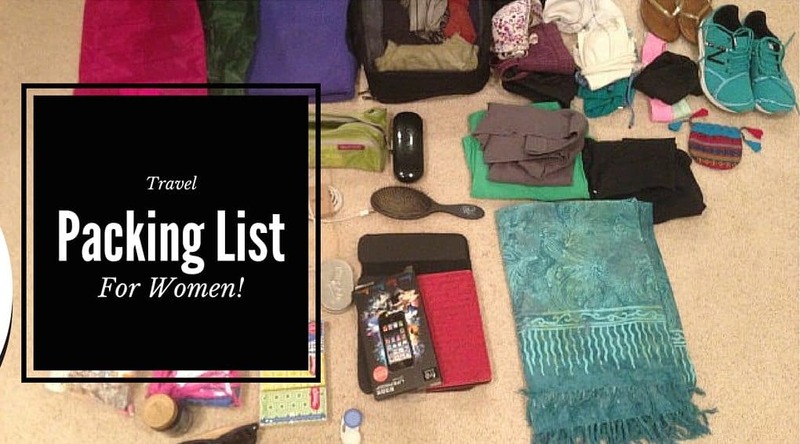 What are your tips for women packing light while traveling?